Follow our route from right to left starting at Marsh Bend Outlet Park (#1). Potts Preserve is next on the map (#2). It was cold last night. Not real cold, probably somewhere in the upper 40’s. But I felt the cold. It seemed to penetrate through the sleeping bag, right down to my skin. I climbed into bed wearing long johns, top and bottom, wool socks and a watch cap. I added a polartec vest for good measure. It was 10:15 PM. About 12:40 AM I woke up feeling cold. After debating with myself for a while about whether I should crawl out of bed to add some layers, I got up and added a second pair of long John bottoms and a full polartec sweater to what I was already wearing. I looked a bit like a woolly bear caterpillar, but I was warm and slept well until 6:15 AM. 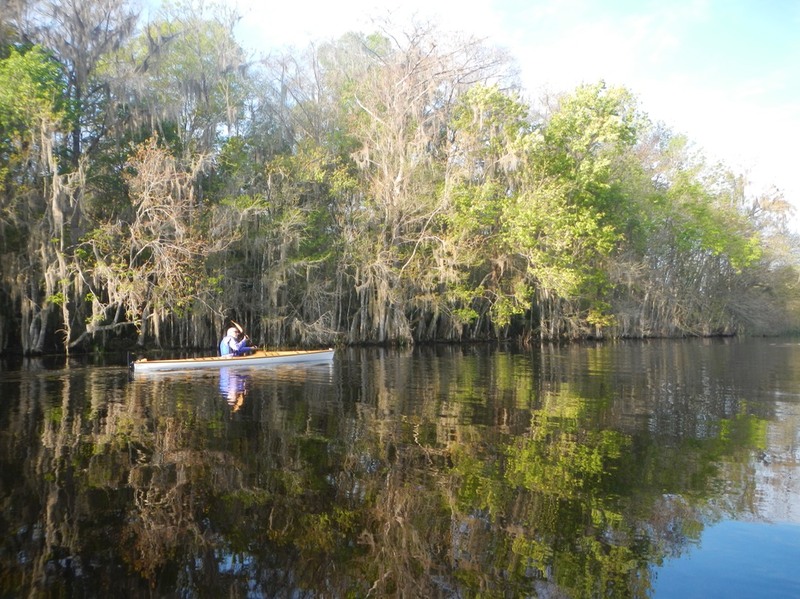 The morning routine was the same as always on these Paddle Florida trips. Pack up your gear, get it on the truck, have breakfast, and be on the water between 8 and 9 AM. The Withlacoochee is a beautiful river. It was lined with Bald Cypress trees, just starting to leaf out. The river was high with its water extending far into the woods on either side. 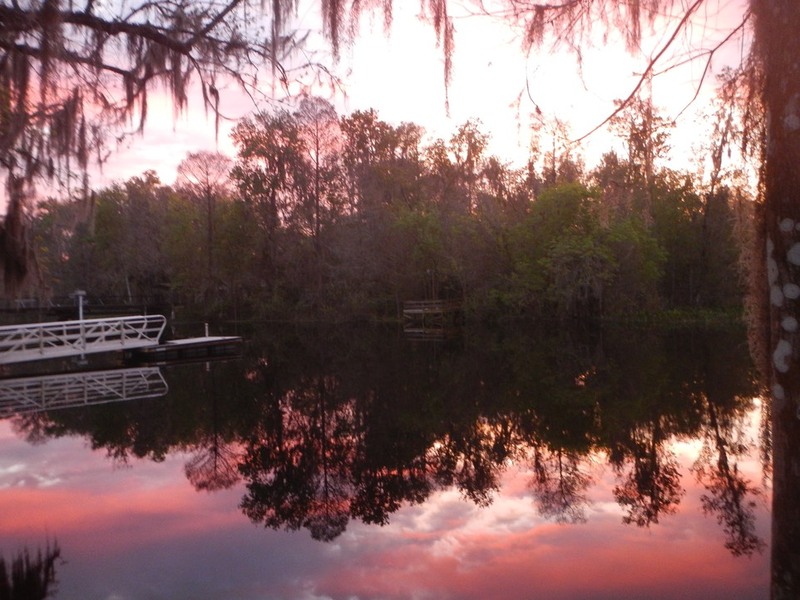 The Withlacoochee is one of two north flowing rivers in Florida (the Saint Johns is the other one). Our route carried us northwest. The early morning winter sun, rising in the southeast, cast a golden glow on everything in front of us. Solitary birds like Herons, Egrets and Limpkins prowled along the shore while Ibis and hundreds of Coots would rise in white and black clouds at our approach. By noon, logs along the shore were crowded with sunning turtles and at least one gator. At times the river was enveloped in a profound silence. At other times all that could be heard was the wind in the trees and the sound of my paddle. Then abruptly a Limpkin would make its raucous cry and shatter the quiet. This is what I make these trips to experience. We had to pass through the Wysong Lock to continue down the river. Now, locks in Florida are not like what I experienced New York State. There, a lock would raise or lower you fifteen to twenty feet or more. Here in Florida the drop might be less than two feet. That was the case with the Wysong Lock. The drop was 18 to 24 inches and the lock was of a simple design, intended to get pleasure boats around the dam. We packed the lock, holding onto the sides or rafting up to get as many boats in the lock as possible. Then the lock keeper did something inexplicable. He lowered the downstream gate before closing the upstream gate. While a few of us managed to hold on till the rush of water lessened, the resulting rush of water flushed most of the boats out onto the river below causing at least one capsize. This video captures some of the action. Somewhere around mile ten my shoulder started to ache (an old rotator cuff injury). I was ready to reach camp which was another three or four miles ahead. When I finally reached camp at Potts Preserve Primitive Campsite (I was the first person to arrive I think) I decided to take a peek at Gum Slough. Gum Slough was recommended as an interesting paddle so, despite my shoulder, I took a look and wound up paddling another four miles as a result. The spring fed slough flowed through a very interesting Cypress swamp. In the lower part of the slough the water is stained dark brown from the tannin in the trees. But at some point there is almost a physical dividing line between the tan colored water of the lower slough and the crystal-clear water of the upper spring fed slough. It was well worth the extra miles.